Made only with real fruit and wholesome natural ingredients—and never with sugary flavored syrups—Papalani™ sorbetto is a dairy-, gluten-, and fat-free frozen treat that will light up your palate with pure, rich, delicious flavor. 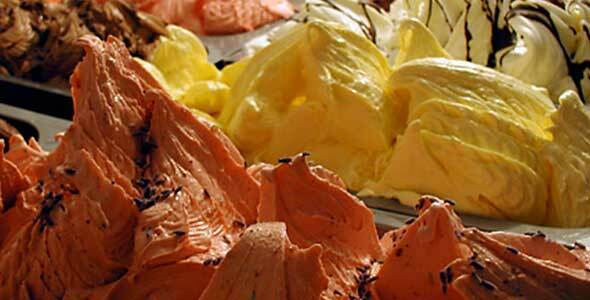 Smooth, silky and soft, our sorbetto contains very little air which gives it a dense, creamy, “ice-free” consistency. And the taste? Pow! Roll over the icons below to see which flavors are sugar-free, gluten-free or nut-free. Tart fresh orange flavor—tropical and Italian. Fresh bananas with dark chocolate—a Hawaiian favorite. Crazy good Hawaiian favorite—pink guava, passion fruit, and blood orange. Hawaiian flavor loved by many. Tart and refreshing made from fresh lemons. Hawaiian passion fruit—intense and refreshing. Tart and refreshing made from fresh limes. Sweet and creamy tropical flavor. Hawaiian favorite fruit flavor—taste of Hawaii in each bite. Sweet and yummy Hawaiian favorite. Sweet and a Hawaiian favorite—loved by many. Mixed berries creating a tart and refreshing taste. Best of all - dark chocolate and sweet coconut. Organic Sugarloaf Pineapples in Season. Organic and Tropical - yes it is worth a flight! For those of us who believe chocolate is essentiall!!. Pineapples are loved in Hawaii as much as any fruit. Bring the flavor of Hawaii right to you.